Morey’s Seafood is our latest sponsor. Their smoked salmon and fish creations are gluten-free. We’re pretty crazy about smoked salmon around here. In fact, when I was working today, Danny sent me a photo of our little guy in his highchair, looking happy, reaching for another bite of smoked salmon. It’s great food for a growing toddler — high in omega 3 oils, good protein, and ridiculously easy to eat — and adults both. I’d say that Desmond’s diet is mostly smoked salmon some days. He can’t get enough. We’re lucky in the Pacific Northwest — wild Alaskan salmon is pretty darned easy to find. Danny smokes salmon for us nearly every week in the late spring through autumn. However, whenever we publish a salmon recipe, we hear from readers all across the country. It’s not as easy to find good salmon here. In fact, when we were in New York in January, cooking a dinner party for someone we adore, we had to go to 5 seafood purveyors before we could find wild Alaskan salmon. That’s why we’re happy to share that Morey’s Seafood is our latest sponsor. These good folks in Minnesota have made great smoked salmon for decades. And now their gluten-free smoked salmon can be in your home too. Money’s also makes a line of prepared frozen fish dishes, most of which are gluten-free as well. 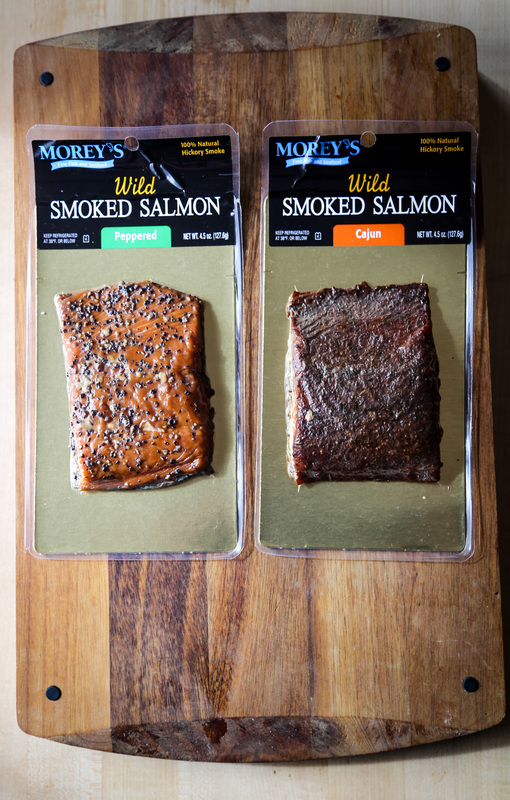 If you want to eat great smoked salmon, no matter where you live, we recommend Morey’s to you. We’ll let them tell you about themselves as well. What made you start Morey’s Seafood? In 1964, Morey’s became a true family business when Ed’s son, Loren, joined the operation. The business continued to expand, with new processing facilities and smokehouse, as well as retail stores in Brainerd and Motley, MN. Today, Morey’s frozen and smoked fish and seafood can be found in retail stores and dinner tables across the U.S. Morey’s also serves hundreds of fine seafood restaurants across the country. Simple — it just tastes great! And because Morey’s has such expertise in smoking. Smoked fish is where the company began. Why did you work to make sure that the smoked salmon is gluten-free? Morey’s wants to appeal to everyone, and whatever we can do to be universally loved by all, regardless of food sensitivities, we do it. Our mission is to provide consumers with quality, satisfying fish and seafood to families’ tables, with unique flavors that are quick and easy to prepare and enhance the seafood experience. Can you share a story of a customer who has loved your products? Morey’s is giving away smoked salmon to three readers of gluten-free girl. Leave a comment here about why you want to win some smoked salmon! Winners will be chosen at random on Friday, March 20th, then notified by email. My mom loves smoked salmon and it would be such a special treat! Exactly to your point it’s very hard to find good wild caught salmon here in KY. These flavors sound delicious. Thanks for sharing another great company and resource with us! My grandparents have a cabin in Northern Minnesota. Every weekend in the summer, we would drive past Morey’s in Motley. One time, my sister asked if they sold the little fish like my dad caught. My dad was not a very good fisherman! I would love to taste some of these yummy sounding flavors! I love smoked salmon – it’s such a splurge, and we love to borrow a friend’s smoker when the salmon are plentiful. But it sure is nice to have a chunk in the refrigerator for quick appetizers or snacks. smoked salmon is the best! Oooh, I would love to try this! I cannot find any good smoked salmon here, so I usually wait til I travel somewhere I can find the good stuff. This certainly sounds like the good stuff! Plus it’s soooo good for you. We would love to try it! would love to win this because smoked salmon is so delicious! My mother many years ago make salmon cakes as a rare treat. I learned to eat salmon years later and have found it one of the most satisfying gluten free dishes I can find since I was diagnosed as a celiac eight years ago. I would really like to try this salmon. we love salmon but don’t get the opportunity to have it very often. Would love to try smoked salmon! Sounds delicious! We love smoked salmon up here! We make a fantastic pasta dish with a pesto and cream sauce and chunks of smoked salmon in it. I’m not sure if you can ship to Canada (or if we can buy it up here, I tried to find out where it’s sold on the website but no luck) but if you can it would be wonderful! My girls are big fans of smoked salmon especially on a bagel with cream cheese, tomato & red onion. I’m sure they’d love to try this, it sounds delicious! Those flavor options from Morey’s will be a wonderful addition to our menu here at home. Smoked salmon makes an easy, quick, and delicious supper. Thanks for sharing a gluten free resource. Sounds like amazing salmon and I would love to try it! My family and I could use a good dose of healthy omegas via Morey’s! I love smoked salmon and my mouth was watering just looking at the photos. I will try to find Morey’s in my local supermarket. Mmmm….smoked salmon! 🙂 I would love to try Morey’s! I love smoked salmon, especially with a few capers on a butter lettuce salad. So good. I have never seen Morey’s smoked salmon in my local stores, but it looks delicious and I would love to try it! Alaska Smoked salmon !! Gluten free too !! I’m in for a try to win love smoked salmon and supporting locally. I would love to win the smoked salmon because yum yum yum and so good for me! Smoked salmon is definitely a rare treat. Would love to try Morey’s! Because I love smoked salmon as well! I would love me some really awesome clean smoked salmon. I would make some lux with some cucumber as the base instead of bagel. Thanks for giving us a shot at it! I never had Morey’s Salmon and would be interested in trying some! I have never had smoked salmon, but I love smoked food and I love salmon. I think smoked salmon would be a match made in heaven. i woujd love to win this! My kids also love love smoked salmon. I love smoked salmon, and although I live in Minnesota I’ve never tried Morey’s. As someone with multiple autoimmune diseases, my diet is in a steady state of modification in order to heal my flares (of UC) and treat my Celiac disease. Shauna’s blog has reinforced the importance of cooking real, wholesome food to nourish myself, and these skills have helped me live the fullest, most enjoyable, most healthy life I can. Fish is the only meat I indulge in, and there is nothing that makes certain aches and pains feel so soothed as Omega 3s! I adore salmon, and these mouthwatering flavors are gorgeously enticing and exciting. I would love to try some of your sustainable, clean, delicious fish! I am always impressed by Gluten Free Girl’s sponsors. These are the best of the best of gluten free, and if they meet the exacting standards of two excellent cooks with an eye toward real quality, taste, and health, I know I can look forward to enjoying them, myself! My grandma always had smoked salmon in her house. When she passed away we found boxes of it stashed away in her house. Everywhere. That woman had bought more salmon than anyone could eat in a lifetime. Now, every time I see smoked salmon I am reminded of her. It would be a lovely treat to try this salmon in memory of my grandma. Why do I want it?–for the taste (esp. the peppery kind), the goodness and the price! I’m a Norwegian who’s land-locked in the desert these days and would love some smoked salmon! My husband and I love smoked salmon and would like to try Morey’s. I love salmon – and salmon is SO healthy. At 87, I am very low energy. So buying salmon doesn’t guarantee that I will cook it before it goes bad. Smoked salmon is the answer. Thank you for this opportunity. I love smoked salmon! When you’re diabetic smoked salmon is a great snack because it’s high in protein. My husband and I lived in AK for many years and were spoiled with salmon “right off the boat” and friends who were wonderful “salmon smokers”. Living in VA, we don’t get the chance for good salmon, so it would be fun to taste something recommended by your site as yummy and gluten free! I would love to try your smoked salmon! I do love it and it’s nice to have a reliable source. Thanks for the opportunity to win. My mouth started to water as I read your smoked salmon post. Iowa is a long way from any waters with any salmon! I visited Morey’s website to discover I was already buying SEASONED GRILL WILD ALASKAN SALMON in frozen individual portions. Guess what’s thawing for supper? Love to try other selections. I would love to try your smoked salmon. It’s been a heck ova winter here. The 20th is the first official day of spring and it’d be a great way to celebrate. Thanks. Yea!! I love smoked salmon and it’s been hard to find good gluten-free smoked salmon. I’ll be looking for Morey’s!! I would love to win as a treat for my 14 month old, who is a big fan of salmon (as am I)! Salmon is my very favorite food and it’s so versatile. I’d LOVE to win some. Yumm! One of my favorite foods in all the world! And so good for healing gut issues! Sounds like an amazing company. Would LOVE to it! My husband and I absolutely love smoked salmon and Morey’s has a great history. Is there any way we can buy it online or at the very least find a “where to buy” directory? I would like to receive some smoked salmon, because I love it and this sounds like the best ever. I once told someone that good smoked salmon is better than any candy ever. My son loves fish, especially salmon (smoked or otherwise). We have a mostly vegetarian, but occasionally pescetarian house because of him. It is important to me, the vegetarian, that any fish brought into the house is as natural and healthy as possible. I would not mind feeding this to my growing boy. Sorry to rain on your parade, but with ingredients like POTASSIUM SORBATE (AS A PRESERVATIVE), NITRITE, RED NO. 40, YELLOW NO. 6, I am frankly surprised that you would accept sponsorship from a company this devoid of awareness of dangers of synthetic additives to our food supply. I have a local (pacific northwest) source for smoked salmon and they manage to make it delicious AND free of nitrates, nitrites, and carcinogenic food coloring. Unfortunately, based on a review of their own website, Morey’s does not seem to live up to their claims of being a “a safe, responsible, and sustainable supply of seafood”, or at least not safe, responsible, or sustainable ENOUGH for my family’s needs. My family loves salmon. I’ve read this site for years because my mother is gluten free. I’ve just gone gluten free and would enjoy this treat. I live in Alaska, and agree smoked salmon is amazing! But it is and always has been gluten-free. Is this company really saying that its rubs/marinades/flavorings, etc. are gluten-free? I so miss salmon – used to live in WA and have fresh salmon a lot. I would love to try this! I dnt even kno if you cud reach me in South Africa. What a treat it wud be! I am salavating at th thought… Salmon is simply my favourite seafood and its not alwsys easy to get. Is yr product available here? Working towards embracing a gluten, egg and dairy free diet…please help! Yum! I’m working on converting my boyfriend into a salmon lover – I think this would do the trick (but if not, more for me!). My son loves seafood and he has Celiac. As a family we are now gluten free and would love to try this product. Thanks for the opportunity!! This Minnesota girl would love to try Morey’s salmon. yes please! being landlocked I don’t get smoked salmon so every time I travel, this is what I order! I’d love to try Morey’s. You can find smoked salmon here (small town, ON, Canada), but much harder to find wild smoked salmon. I’m thrilled that your flour store is open! Thank you!!! I’m trying to buy 24 boxes of your flour but the “Continue Shopping” button doesn’t seem to work; the total keeps coming up as 12 even though I used “Continue Shopping.” Could you help? Thank you! –Ori G.
Ori, thank you! I’ll check with our developer to see if he can address this. And thank you! A few nights ago, while my husband, children and I were chatting over dinner at home. I mentioned we needed to get some really good smoked salmon. Growing up in Northern California my father would go fishing for a weekend with his friend. After the fishing trip, his friend Larry would smoke the fish. This was over 27 years ago… I was probably around age eight and I would open the refrigerator and as if it was put their by magic, I would see a shiny wrapped foiled shape. I would reach my little hand under the foil and a chunk of salmon would appear in my hand. I can almost taste it now. Thank you for this chance to share my fond memory of my father and his fishing days and a chance to win some happy Smoked Salmon! honestly, I’m not sure I’ve ever had smoked salmon. I’d love to try it. Raised in the Pacific Northwest, I used to go fishing with my dad and would remember him “throwing back” the salmon that didn’t meet his expectation. Now I’m living in North Carolina and miss salmon like crazy. Yes, you can get it here, but it isn’t fresh wild caught Pacific and definitely not smoked. You’d make this “transplant” one very happy gal if my name was chosen to receive your amazing product 🙂 Thank you!